Google Play Store still lacks SMS App with dual sim support | NewbieTechTips! Play Store is the native Google's Android Market place from where users can download free and paid apps, games, ebooks, music and even movies. It boast >600,000 apps available in Play Store which is a big number. But many apps in the Store are bogus and not useful at all. Anyway what I wanna point out here is as of today out of all the apps available in Play Store, there is no solid SMS app which support dual sim system. Recently there is a steep rise in the market share of Dual SIM Android mobile phones. Samsung has launched >10 new Android phones with dual sim support including Galaxy Grand Duos, Galaxy Grand Quattro, Galaxy S Duos, and many other small and medium segment Android Smart Phones. In india companies like Micromax, Lava, Zen etc are making all Android phones dual sim. With all these handsets it makes a very large share of dual sim sets in the market. But it looks like App developers are yet to add dual sim support to their SMS apps. None of the popular SMS app support dual sim feature. Few of the most popular SMS apps on android market are Go SMS Pro, Handcent SMS & Chomp SMS. Go SMS Pro is one of the most popular SMS app available in the android market with 50,000,000+ downloads. Recently Go Dev team included ads or sponsored msg (can be deactivated by paid upgrade) in the free version of Go sms app, which caused slight decrease in its popularity. b. Lots of free themes from theme shop and Theme maker where you can make ur own wallpaper theme. j. SMS backup and restore. - helpful if you are changing the mobile phone. a. MMS sending still buggy on many devices. b. Large file size (~12-15mb after installation, problem specially for older mobiles with limited internal memory. c. Ads (including airpush ads) on free version - annoying as they appear on the status bar all the time. d. No dual sim support. Handcent SMS is one of the oldest SMS app available for Android. It is also highly customizable sms app. c. Ads (admob) in settings page. 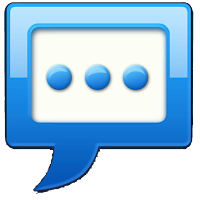 This is the third best SMS app for android users. Its also pretty good with many customizations and popup support etc. Its free version has limited features and is ads supported. There is a paid upgrade available. But alas this app also does not support dual sim.